Charles Dickerson, known as Mono/Poly, has a bit of a history with me. We met in 2005 while attending the University of Cal State Fullerton. Charles was studying Computer Engineering and I'm sure we may have never crossed paths had it not been for his enthusiastic approach to music. One week while I was recording BTS at the old Titan Radio studios, Charles showed up and introduce himself. Expressing he liked what I was doing with the program, he asked if it was okay to hang out while I recorded the show, I agreed. We struck up off mic conversations on music, art and politics. It became a weekly routine and towards the tale end of my time at Titan Radio, Mono/Poly even became an unofficial co-host (There may or may not be existing copies of us freestyling to close out shows). During these weeks he mentioned he made music and was largely influenced by artists like Timbaland and '70s jazz-fusion group, The Mahavishnu Orchestra. The first batch of beats he ever gave me, weaved electronics with more traditional R&B and Funk. As months passed, later batches would became a bit more abstract, aggressive and bass heavy. Track presentation was advancing and you can hear what was a whirling mind trying to push out as many ideas as it could. Since the beginning of BTS, I've had the complete pleasure, and honor to see producers rise in their creative output, quality and career. From the first meeting, to compilation features, tours and realization of the debut LP. I'm happy I got the chance to see this happen step by step with Mono/Poly. Mono/Poly's debut album, Paramatma, is out now on Tasteful Licks Records. It's been a long time coming, but here now. 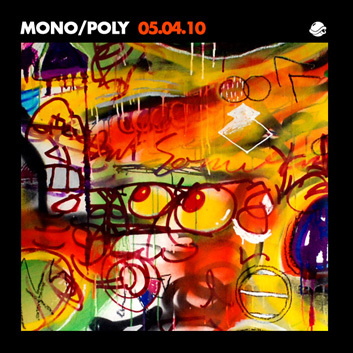 Mono/Poly's Spring 2010 Mix, exclusively for Andrew Meza's BTS Radio.